Are you attending the International Roofing Expo, IRE, next week in Nashville? Please join me and my fellow awesome colleagues Moderator Joanne Rodriguez, Mary Ann Uhlmann, and Elizabeth Hart Morris for our TU16 “Vegetated Roofing: A 10-year Perspective on Growth and Opportunities” on Tuesday, February 12 from 9:30 am – 11:00 am, Room 204. Joanne Rodriguez works to advocate for healthy, affordable, durable building environments. She has three decades of experience working within the building products and construction communities, with an emphasis on sustainable building impacts and high performance building envelope assemblies. Working across the many influencers of design and development, she is helping the ever-expanding market on topics related to sustainability impacts through water, waste, energy and air. In 2017 she fully launched GreenStructure, a multidisciplinary environmental consulting firm. At Tremco, she was responsible for the development of sales and marketing platforms focused on sustainability in the built environment. Mary Ann Uhlmann, GRP is an Environmental Horticulturist and President and Founder of Urban Horticulture Consulting. As a Green Infrastructure Consultant, Mary Ann brings more than 15 years of experience in the construction and maintenance of vegetated green roofs and living walls. In 2007, Mary Ann joined Tremco Incorporated as their first horticultural subject matter expert in their newly formed Sustainable Technologies Group. In 2015 she formed Urban Horticulture Consulting, offering green infrastructure planning, training and asset management. She is a passionate advocate for both Green Infrastructure and Biophilic Design education. Elizabeth Hart Morris, CDT, GRP is the Director of Vegetated Roofing Assemblies at Henry Company. For more than 10 years Elizabeth has been changing the “nature” of commercial roofing through green roof project management, roof recycling, and advocacy. Elizabeth is the President of the Green Roof info Think-tank (GRiT), a non-profit organization dedicated to growing the knowledge and use of green roofs in the Pacific Northwest, and serves as the Green Roof Professional Education Chair on the Green Roofs for Healthy Cities Board of Directors. Linda Velazquez, ASLA, LEED AP, GRP is founder and publisher/editor of Greenroofs.com (1999) and writes extensively about greenroofs, greenwalls and the living architecture community. Greenroofs.com hosts the biennial Greenroofs & Walls of the World™ Virtual Summit, and Linda speaks internationally on the topic of trends and green infrastructure. 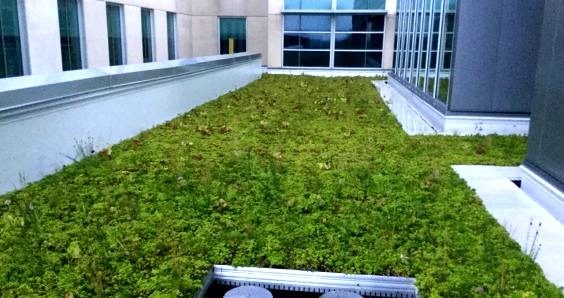 Greenroofs.com was the first universally available clearing house of information on greenroof projects, technology, and diverse professionals, companies, and organizations from across the world, and is a dynamic interactive website, online media company, vibrant social network, and comprehensive resource. The History of Why….vegetated roofing—how did we get here? Our 90-minute session promises to be extremely interactive, educational, and fun! Don’t miss it. 1 reply to "Join Us at IRE: “Vegetated Roofing: A 10-Year Perspective on Growth and Opportunities” Power Panel"
Looks like an awesome panel! We’ll be at IRE as well so we’ll have to stop by. Looks like a great group of experts.